Nissan is taking the LEAF Zero Emission concept to a different level with the NISMO RC LEAF Concept Vehicle. According to Nissan, the race car features a 3.9-inch shorter wheelbase and is actually sitting 13.8 inches lower than the production version of the same car. 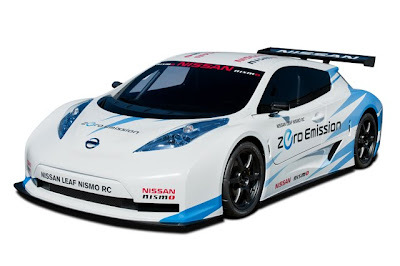 The 2-door race version was created by the Nissan Global Design Center in Japan and features a special 4-coat Pearl White paint with blue NISMO/Zero Emission graphics. Already a world leader in zero emission production vehicles with the late 2010 launch of the Nissan LEAF passenger vehicle in the United States, Europe and Japan, Nissan is now looking at the racing world as a way to draw attention to the seemingly untapped potential of electric vehicles. 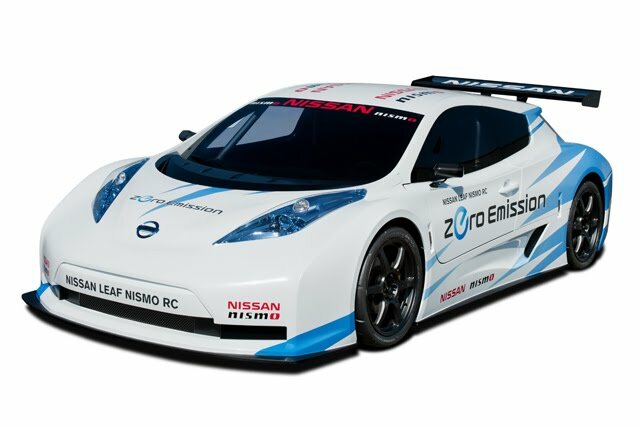 “Combining the talents of NISMO, Nissan’s world renowned motorsports group, and engineers behind some of the company’s Super GT and FIA GT1 race teams, the Nissan LEAF NISMO RC will serve as a rolling laboratory for the accelerated development of EV and aerodynamic systems, as well as a platform for the development of new green motorsports series,” said Carlos Tavares, chairman, Nissan Americas, speaking at the New York International Auto Show. The new electric race vehicle will likely make a series of special demonstration appearances at various motorsports venues in 2011, with the company exploring pioneer zero emission competition spec series in future years. The Nissan LEAF NISMO RC is designed and constructed as a real racing machine, starting with its full carbon fiber monocoque bodywork. The three-piece bodywork includes removable front and rear sections, fixed windows, LED headlights and taillights and driver-adjustable rear wing. Building on the unique exterior styling of the production Nissan LEAF, the 2-door race version was created by Nissan Global Design Center in Japan. Special 4-coat Pearl White paint with blue NISMO/Zero Emission graphics completes the exterior. Dimensionally, the race car features a 3.9-inch shorter wheelbase, is 0.8 inches longer and 6.7 inches wider. The most dramatic difference is height, with the NISMO RC sitting more than a foot (13.8 inches) lower than the production Nissan LEAF. Ground clearance is limited to 2.4 inches, compared to 6.3 inches for the road going car. And, at 2,068 pounds, the race car weighs in at about 40 percent less than the production vehicle.